The glove is produced from standard acrylic or stretch-nylon base yarn and it can be made on a conventional industrial knitting machine. The wearable device looks and feels like a normal glove, except it has conductive pathways knitted into the material. The fingers are tipped with contactors, so if a user puts his or her thumb together with any other finger, they will create an electric circuit. The glove is completely wireless and its power pack and Bluetooth device is mounted at the cuff. Engineers at EFS tested the use of the glove with a virtual instrument computer game. The demonstrator fiddled his fingers to simulate the plucking of guitar strings on the PC screen. 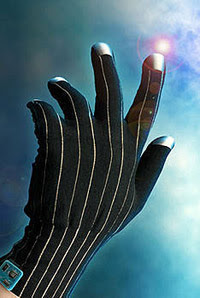 However, Hunter said the applications for these gloves could go beyond the gaming world. He and the other developers have been talking to clinical partners in some of Manchester University's five teaching hospitals.